DWR Custom Woodworking offers 2 different ladders as pictured. 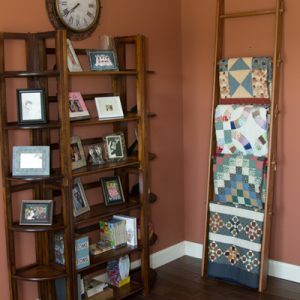 The Quilt Ladder has parallel side rails and the Apple Ladder has tapered side rails. 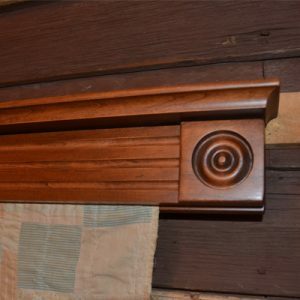 Assembly is the same on both ladders; a tapered peg is inserted into a hole drilled in the tenon of the rung. 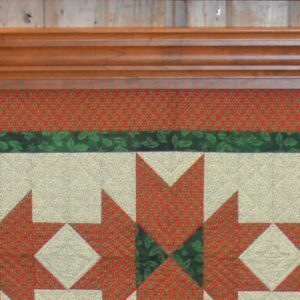 The rails are 3 1/2″ wide to support the quilts that are displayed with out bowing. The 3 1/2″ rails also provides additional clearance at the top rung for clearance between quilt and rung. The ladders are assembled with tapered pegs and no screws or other hardware are required for assembly. The pegs can be seated with a mallet to prevent spinning. 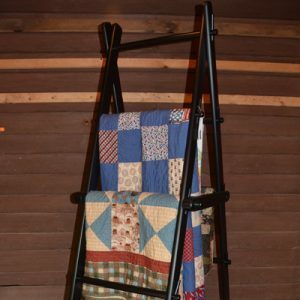 As with all DWR Custom Woodworking quilt display products, the ladders are stained to your specified color and cleared coated with a high quality urethane base cabinet finish for long lasting beauty and durability.